The Jewish deli is alive now more than ever in New York City, with new Jewish restaurants, and cafes opening up in hip and trendy places like the Lower East Side, Soho, and all over Brooklyn. 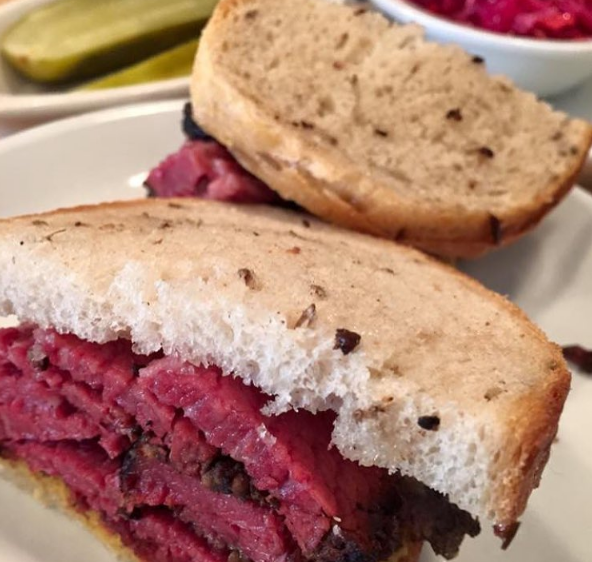 With so many fantastic Jewish food options in NYC–bagel shops, knisheries, bakeries and delis galore–it can be hard to decide what and where to nosh. 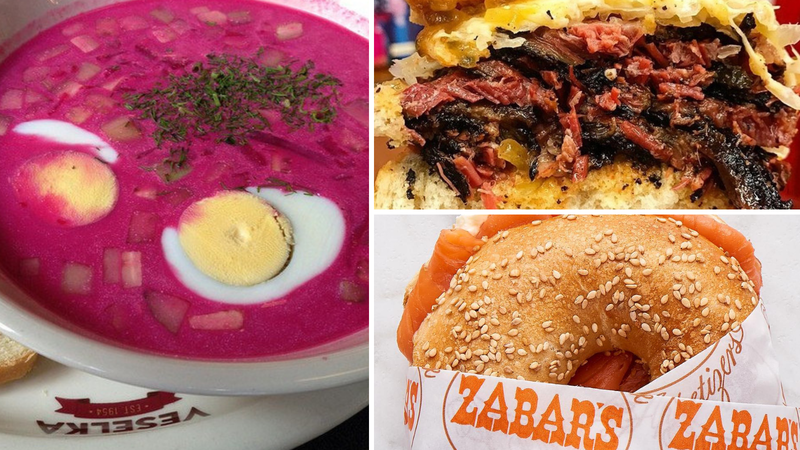 Here’s a collection of our favorite places to get Jewish food, including new shops and plenty of old favorites. This award-winning Upper West Side establishment has been a classic appetizing store since 1908. It’s restaurant menu has all of your favorite Jewish comfort foods, but the matzah brei is definitely the best–served pancake style or scrambled with your choice of preserves or applesauce. Just a few blocks away from Russ & Daughters’ iconic store is their sit-down cafe, which opened in 2014 and has since been named one of the 10 best restaurants in NYC by the New York Times. Their latkes, almost two inches tall, are the best in the city, seasoned perfectly and fried with a satisfying crunch. Photo from Katz’s Deli Instagram. 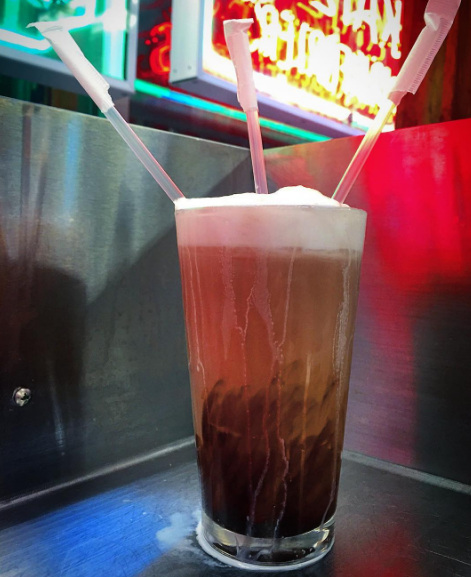 The egg cream, which contains neither eggs nor cream (who would’ve thought? ), is made with Fox’s U-Bet chocolate syrup, whole milk, and seltzer. It comes in a tall, 20-oz glass–you might want to ask for two straws! Of course, you might as well order a pastrami sandwich, matzah ball soup and thick-cut fries while you are there. In the early days, they sold bialys by the bag. 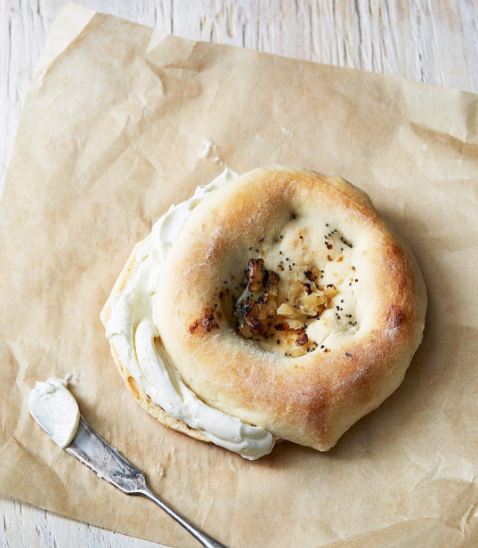 Today, they’re resurrecting the tradition of bialys, offering new flavors, great coffee, and plenty of other Jewish foods like bagels, babka and hummus alongside. 2nd Ave Deli might no longer be on 2nd Ave, but nothing else about this restaurant has really changed since it opened in 1954. The chopped liver is the best in the city, made with a mixture of veal, beef, and chicken liver, hard boiled eggs, and onions. It pairs magically with crispy curls of gribenes, fried chicken cracklings. If you’re feeling especially hungry, try on of their triple decker sandwiches, especially the “Everything but the Kitchen Sink” which just might be our favorite. The best challah sandwich is found at B&H Dairy, which was established in 1938, a time when Jewish restaurants typically specialized in either meat or dairy to keep kosher. This place has the kind of old-school soda counter vibe that harkens a time when kosher delis and Yiddish theaters lined 2nd avenue. Borscht, and many other items on the menu, were definitely among the things that these two groups had in common. 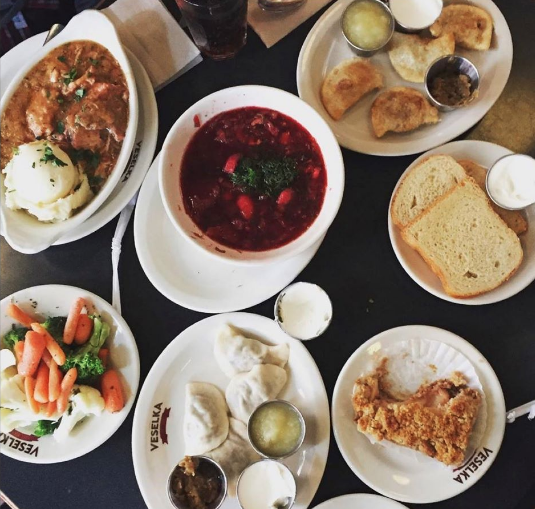 This deeply flavorful borscht, made with home-made stock and vinegary beets, is perfect accompanied with Veselka’s equally famous dumplings. They also have a vegetarian version which is as delicious as its meat counterpart. Breads Bakery is relatively new compared to the others on this list, but everyone says its babka is the best. Countless layers of laminated dough are spread, rolled, and twisted with a chocolate hazelnut filling for the ultimate sweet treat. Sure, you’ve had your standard nova or lox. But have you tried Zabar’s Pickled Lox? These bite-sized chunks of fish in a creamy, salty brine are a perfect balance of sweet and sour. While you are there, try any of Zabar’s other smoked fish offerings and their delectable baked goods, like their cheese Danish. 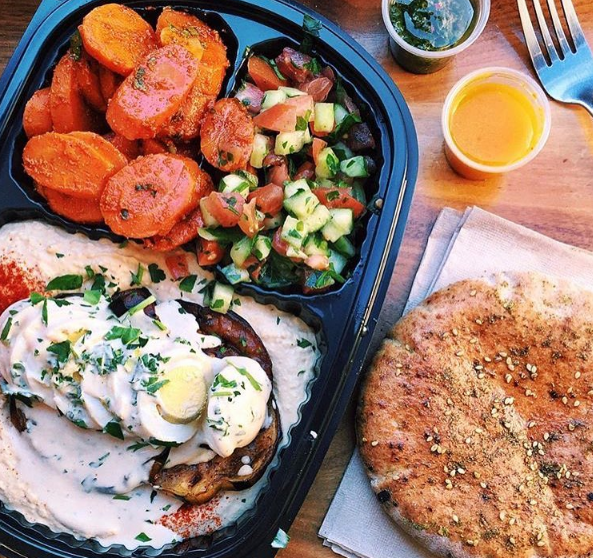 Get the flavors of Tel Aviv at Taim, a cozy falafel and smoothie shop in the West Village. Everything is made with fresh ingredients by hand, including za’atar-dusted pita, baba ganoush, and three must-try flavors of falafel. Smoked meat photo from Mile End Deli’s Instagram. In the style of Canadian Jewish delis, Mile End Deli doesn’t serve pastrami (gasp!). But their smoked brisket–simply referred to as “smoked meat”–might just become your new favorite thing. Wondering why Canadians prefer smoked meat and Americans prefer pastrami? Serious Eats leaves no rocks unturned. Head to Peck’s, a picture-perfect deli counter and coffee shop (with a backyard!) in Clinton Hill, Brooklyn, for all things homemade, small-batch and Jewish. They make house-cured pastrami, potato and schmaltz pierogis, a number of pates, harissa-spiked shakshuka, and plenty of sweet and savory pastries (try the cornbread muffin with an egg baked inside of it!). The owner of Peck’s was born and raised in the Jewish deli scene–his great grandfather started Ratner’s Kosher dairy restaurant in the Lower East Side–so we think you’ll enjoy this new-ish Jew-ish approach. Romanian-style chicken liver is really something you can only find at Sammy’s. Pete Wells calls it “the most wonderful terrible restaurant in New York” and describes its atmosphere as a “nonstop basement bar mitzvah.” Enticed yet? Their servers make their Romanian-style chopped liver right at your table, mixing in grated radishes, gribenes, and chopped onions. Looking for a no-frills spot to grab a hummus platter? This is the place. Just zip on over to the Upper West Side. Open since 1952, the Knish Nosh in Rego Park, Queens, is a knish destination worth the trip. Their hand-rolled knish varieties are filled with kasha, mushrooms, pastrami and more. 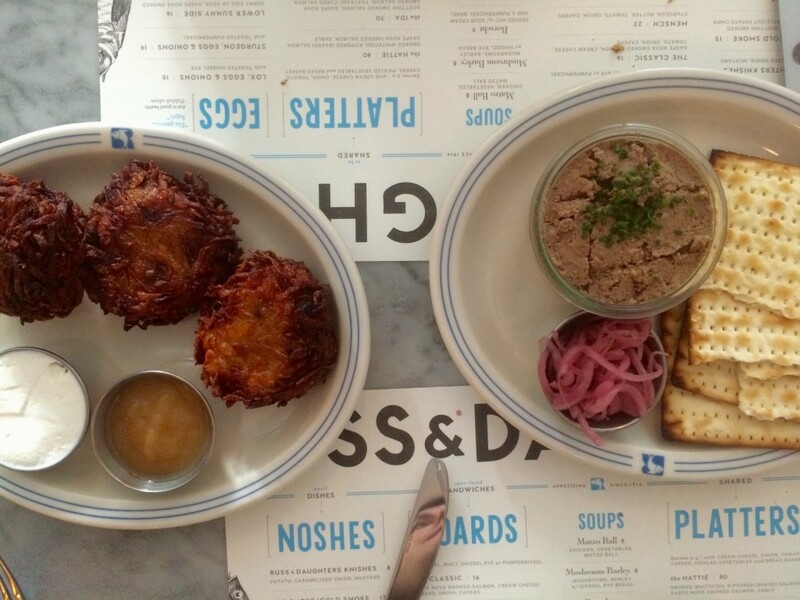 If you can’t make it to Queens, get your nosh on at their Upper East Side location. 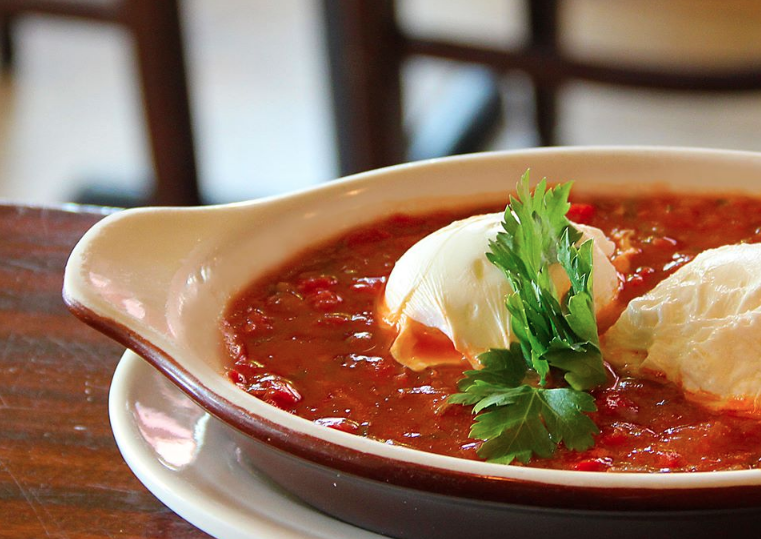 The shakshuka at Miriam’s, an Israeli restaurant in Park Slope, Brooklyn, is our favorite in NYC. Its bright and flavorful tomato sauce is simmered with warm spices and its eggs are perfectly poached. Deciding on who makes the best bagels in NYC might be one of the hardest decisions we’ve ever made. They all taste pretty good when fresh out of the oven. But the Bagel Hole in Park Slope raises the bar. You wouldn’t know it from its bodega-like exterior, but they’ve been making what they call “old-fashioned” bagels since 1986–small, crusty, and chewy all at once. Uzbeki pilaf (plov), is a rice pilaf with carrots, spiced with cumin and cardamom. New York Magazine says, “Dishes hail from the states around Bukhara, Uzbekistan, where Jews have lived since the Babylonian exile.” Taam Tov, Hebrew for “good taste,” is pretty accurately named, and probably the tastiest and most affordable meal you’ll find in NYC’s diamond district. Photo of greybeh from Mansoura’s website. Mansoura Bakery in Midwood, Brooklyn, was opened in 1961 by a Jewish family from Cairo, who came from a long line of Syrian bakers. Their specialties today include pine nut and pistachio macaroons for Passover (you won’t find coconut macaroons here! 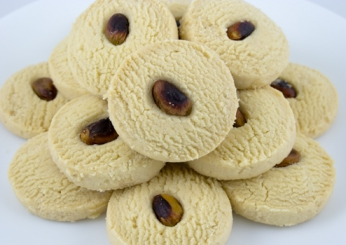 ), and greybeh, which is a shortbread cookie with a roasted pistachio on top, made year-round. Be sure to also try their pistachio turkish delight! 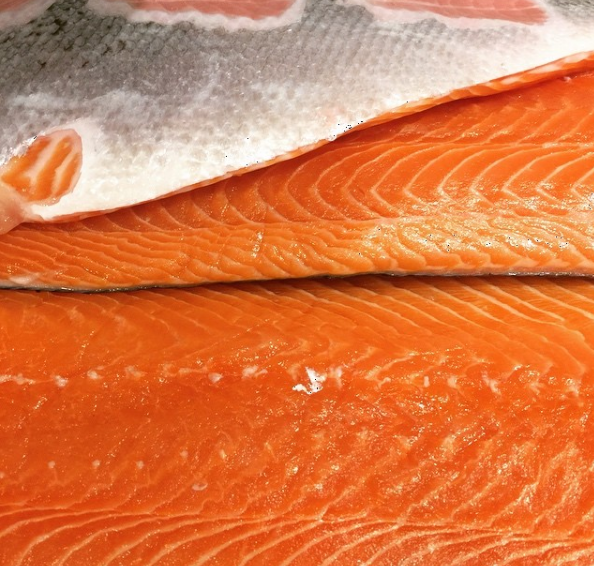 If you love smoked fish, Shelsky’s is the place for you. Their extensive smoked fish and sandwich menu is proof that we’re in the middle of a Jewish food renaissance. Hallelujah.